Andrea Pilot is the offspring of a fundamentalist preacher and a teacher of languages. She no longer settles for small gods or for others’ definitions of truth, and writes as a means of unflinching self-possession. Andrea still has hope for a world that is compassionate rather than assaultive, innovative rather than staid, and big enough to require more than five senses to experience. For more from Andrea, check out her blog and read her poem marrow. Also find Andrea on Instagram @justsaynotoapocalypse. These days, almost every Poet has her Perch. In a diverse, artistic city like Nashville, there are now many Open Mics for Poets. 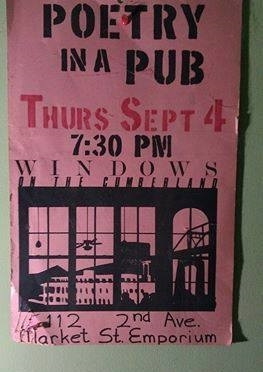 This is in large part due to the hard work done by organizers like Ruth Hairston and Larry Pacheco of the original Windows on the Cumberland crew from the 80s, their successors D. Phillip Caron and C Ra McGuirt, and more recently, Michael “Map…” Pierce and Christine Hall of Poetry in the Brew. And yet in this, the Music City, the old-school original songwriter is often left out in the cold. We aim to fix this, at least for the month of March, by holding an open mic for songwriters, singers, and musicians at Portland Brew East on Saturday, March 24.